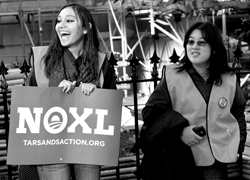 News Post: Will the United States Approve the Keystone XL pipeline? On Thursday November 10, the U.S. Government stayed approval of TransCanda Corporation’s Keystone XL pipeline until after the 2012 election. The Canada-U.S. pipeline would carry 700,000 barrels a day of heavy crude extracted mainly from Alberta’s oil sands and used for refining on the Texas Gulf Coast. As currently designed, the pipeline would cross the Canadian border, extend through Montana, South Dakota, Nebraska, Kansas, Oklahoma, and into Texas. This project is allegedly “shovel ready” and it could potentially generate scores of jobs. In addition to acting as a boom to the economies of Canada and the U.S., the project could relieve a supply bottleneck causing a “disconnect between depressed U.S. Midwest oil prices and global rates paid on the coast.” On the other hand, those in opposition to the pipeline are raising serious concerns regarding negative effects to the health, safety, and environment. Whilst the Government delays the decision, many eagerly await the answer to whether the United States will approve or refuse this momentous project. Canadian Prime Minister Stephen Harper, a supporter of the pipeline, has voiced his belief that the $7 billion project is in the best interests of both the Canadian and U.S. economies. It is anticipated that the pipeline could bring 20,000 “well-paying jobs” to the U.S. alone, just for its construction. It is also estimated that as many as 130,000 jobs could be generated after project completion. Some analysts fear the delay could kill the project and argue that the project’s failure would result in a lost opportunity to create jobs and enhance energy security. The U.S State Department’s decision to delay approval of the pipeline was largely based on environmental concerns. The department’s particular rationale was the need to study an alternate route that would avoid environmentally fragile territory in the Sand Hills of Nebraska. Other concerns included large emissions of green house gases generated by the production of oil sands crude and its related effect on human health and safety. Moreover, the ongoing production of oil would require the cutting of 740,000 acres of boreal forest in Canada. The decision was therefore viewed as a victory for environmental groups. However, others argue that the delay was merely a political strategy, and that concerns over environmental impact from the pipeline were resolved when Energy Secretary Steven Chu publicly endorsed the project following findings by some experts that the potential impact would be nil. Others have voiced concerns that the delay will strain relations between the United States and Canada. This political strain will most likely be short-lived. However, the project’s failure could put Canada in a precarious position. The European Union is already considering labeling oil sands crude as “inherently polluting under a new fuel quality directive.” Without access to the Texas refineries and European markets, Canada will have to shift its priorities to accessing Asian markets for energy production. The Canadian government further warns that energy prices across Europe may be driven higher as a result. The debate over this pipeline’s approval reflects the conflict between the demand for economic growth and environmental protection. The conflict, however, is not unique to the United States and Canada. The evolving contours of environmental protection in the face of economic growth has been, and continues to be, discussed by the United Nations as well as by a myriad of individual countries. Conflicts such as the Keystone Pipeline project indicate that a single country’s judgment on the balance between environmental protection and economic growth will directly affect its neighbors and the greater global community as a whole. Consequently, it is becoming increasingly clear that discourse regarding environmental ethics and further development of ethical standards in relation to economic growth at an international level is indispensable for our global community.